It pleases me to hear a sense of pride when people talk of their days in one of our Catholic Schools. In my role as bishop, I have the great pleasure of traveling throughout the diocese and speaking to current students, alumni and families who share their Catholic school stories of community, faith, and yes, even a winning athletic season or two. I cannot explain it in words, but there is something in their voices and in their gestures that express their sense of belonging, and no matter how many years it has been since their graduation day that feeling does not fade. If I were to reflect on what drives that feeling among so many, I would say that as Catholic school students we are part of something greater. Through the years of the old parochial league and even today in our 22 Catholic schools, each school has a different set of traditions, practices, teachers, sports and electives. We do, however share one Lord, one faith and one baptism. Our faith in Jesus Christ and sharing the good news of the Gospel is what brings us together. It is at the very core of who we are and what we believe. Some may not recognize it right away, but it shapes and molds us into who we are and who we will become in the future. Certainly for me, my life long journey in Catholic schools through seminary shaped who I have become as Bishop of Syracuse. As you read through these pages of Pillars, you will find stories of faith, innovation, family, service and community. These are truly the hallmarks of our Catholic schools. They are also essential components for the new evangelization. 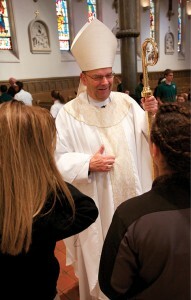 Our schools fulfill a primary role in the church’s mission of evangelization. They need the support of the entire ecclesial community—not only parents who support our schools through tuition, or parishes and regions that maintain a school through generous financial support, but parishes without schools and indeed all the faithful of our community. We hope you will continue to offer your support and thank you for helping us carry out the mission of Jesus Christ.